Central Kentucky basically covers the Blue Grass Region outside Lexington. The core of this region is the ring of Circle Cities, the county seats forming a rough circle around Lexington in all directions, the so called Inner Blue Grass. They are in turn surrounded by a second ring of county seats further out, in the Outer Blue Grass. Both rings are Old Money towns, with large homes and spacious farms dating back to pre Civil War days. The original source of all that wealth was Hemp. Back in the Clipper Ship era, Kentucky Hemp was the best in the world for its strength, flexibility and durability. Whaling ships, battleships and frigates from every nation in the Western Hemisphere all used hemp from these counties. Almost all of those mansions and beautiful courthouses were built with hemp money. 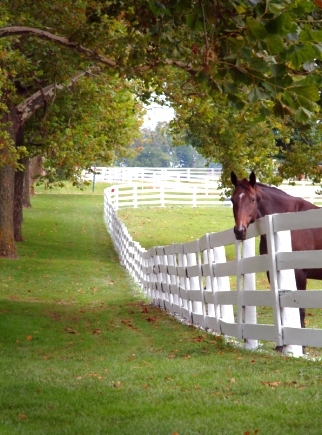 Once the sailing era faded, hemp was replaced with thoroughbred horses and tobacco. The limestone soil contains the highest calcium concentration in the world, producing strong bones in horses and strong nicotene in tobacco leaves. Today, with tobacco in decline, farms are shifting again, diversifying into cattle, sheep and vegetables. 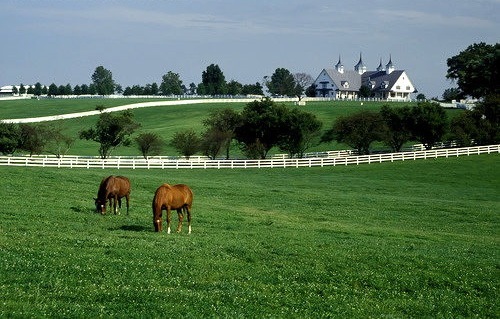 However, the Inner Blue Grass remains the greatest concentration of thoroughbred horse farms in the world. Whatever the base, for 200 years these counties have enjoyed wealth and prosperity. Their people are accustomed to the best. A restaurant in these towns needs to be good to survive, with menus blending very traditional with cosmopolitan cutting edge. 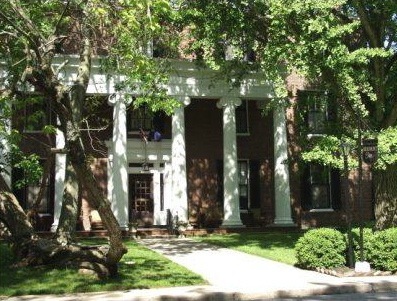 Beaumont Inn in Harrodsburg is a gorgeous hour drive from Lexington through not only horse farm country but the spectacular Kentucky River Palisades. This lodge has hosted and fed the rich and famous since 1919 and is still run by the same family. Lunch seatings are at 11:30, noon and 1:15, dinner seatings at 6, 6:30, 7 and 7:30. A Kentucky Cheese Tray and Fried Green Tomatoes highlight the appetizers. The inn's famous Corn Pudding comes with every meal, along with whipped potatoes and cream gravy. The entree list is pretty impressive, but our favorites are the Yellow Legged Fried Chicken, Two Year Old Kentucky Cured Country Ham, Southern Fried Catfish, and two show stoppers : the Classic Beaumont Dinner, a combination of their Country Ham and Fried Chicken, and the Mercer County Strip. If you're into steak, you HAVE TO order this. It's an eight ounce, properly aged "New York" strip from Montgomery Farm three miles from the Beaumont Inn. The cattle are free ranging, grass fed, organically grown and locally processed. Unless you've been to Texas or Wyoming, you haven't had a steak like this. There's also The Owl's Nest, a classic colonial pub with a separate menu rivalling the main Inn's. There's a Beef & Shrimp Skewer, Kentucky Hot Brown, Deep Fried Zucchini, Kentucky Chicken Livers, and various interpretations of barbeque, ribs, fish, and chicken. 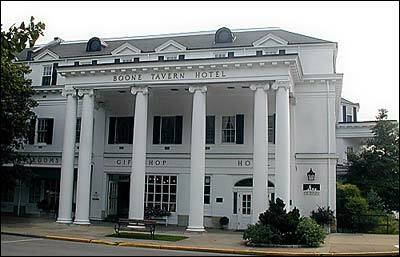 Boone Tavern in Berea is an absolute requirement for a Kentucky restaurant lover. 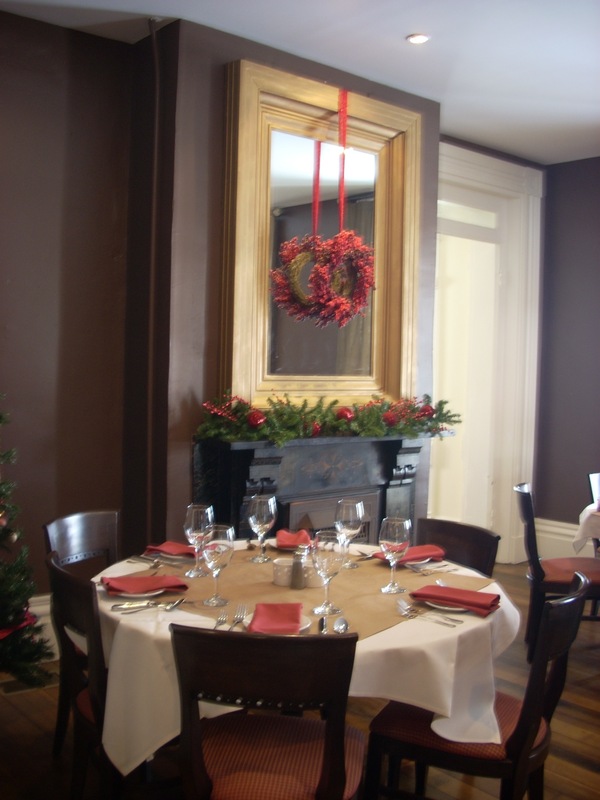 It has been serving classic Southern Appalachian cuisine in very elegant surroundings since 1909. 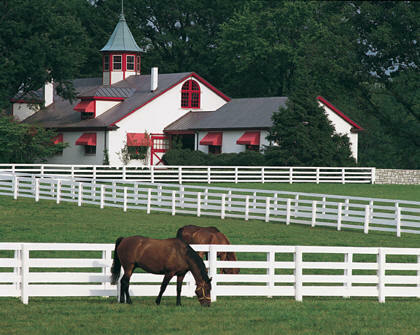 A 45 minute drive from Lexington, it is a favorite road trip, especially for its famous 10-2 Sunday brunch. They're famous for their salads (Fried Green Tomato Salad, Southern Fried Chicken Salad, Creole Fried Oyster Salad, Smoked Salmon Salad, etc. ), their sandwiches (Pimento Cheese Burger, Chicken Cordon Bleau Burger, Ham Apple Cranberry Sandwich, etc. ), and their Spoon Bread, which comes gratis at every seating. But their entrees are the show. Chicken in a Birds Nest, Sourdough Hot Brown, Bluegrass Lamb Pot Pie, Brown Sugar Salmon, Oat Crusted Rainbow Trout and Cider Roast Duck are state treasures. They add their own twist to other regions' favorites. Their Pork Chops are tomato parmesan breaded over stewed white beans and braised greens in a mushroom gravy. New York Strip is garlic herb marinated. Their Scallops are pan seared with ham hock risotto, swiss chard, toasted pumpkin seeds, roasted garlic and carrot coulis. 90% of the food is locally produced. 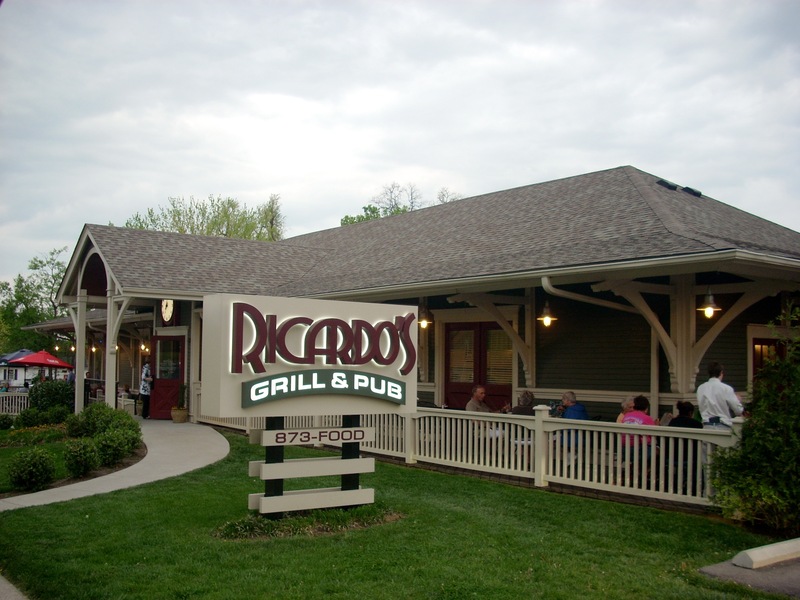 Ricardo's opened in April 2009 in the old Southern Railway Passenger Station at the top of the hill along Main Street, across from Margaret Hall Academy, in Versailles. It's a pleasant 30 minute drive from Lexington. Service is atrocious, parking is a problem, and you should expect an hour wait for a table. But you HAVE to go. The food ranks with the best in Kentucky. Among their appetizers, the Calamari is the best we've ever tasted. Their Soups of the Day are all good, but the best of the rotation is the Cuban Potato Soup. There are lots of things besides potato cubes in there and the spices make it quite lively. The salads are large and fresh and the made on premises dressings are great. The Pinot Grigio heads a very impressive wine list, although many frequent visitors just order the homebrewed Iced Tea. Among the entrees, the Kentucky Hot Brown is a fine interpretation of this old classic. Their Scallops, Chilean Sea Bass and Shrimp are delicious but if you're up for fish you really ought to try the Walleye. Rarely available in Kentucky, this Minnesota Boundary Waters delicacy is listed fried but can be had grilled by request and is better that way. With all their fish come outstanding homemade sauces. They do a fine job with steaks, especially on those nights when they offer the $10 ribeye special, which at that price is an absolute steal. You're probably going to be too full for dessert, but their Key Lime Pie is a contender for statewide honors. Circa 1840 is Georgetown's entry in the cutting edge gourmet restaurant sweepstakes. Only half an hour from Lexington, it is on US 25 two blocks off the square in downtown Georgetown, in a remodelled 1800s home. Chef Rod Jones has prepared a menu emphasizing locally grown foods and a few carefully prepared entrees. This is not a large restaurant so reservations are a good idea, especially on weekends. One room holds the bar and two rooms hold a dozen tables for diners. The 1840 wins our trophy for service. Whatever they pay their wait staff is not enough. In an era of slow, apathetic or unskilled service, this place could be a model for the other 200 restaurants in Central Kentucky. And the crowning gesture is the chef himself emerging to make the rounds, asking each diner about their meal. You certainly feel pampered. And then there's the food. There are six appetizers, six salads and a soup of the day. Their Calamari is pretty good but we like the Tomato Souffle (artichokes, sun dried tomatoes, capers and Bermuda onions baked in asiago cheese) and Andouille Sausage Tapas (skewered smoked cajun sausage with roast piquillo peppers in a chipotle aioli. The 1840 House Salad (garden greens, carrots and cherry tomatoes in the chef's vinaigrette, plus you can get grilled chicken added by request) is excellent, or you could step up to the Rock Shrimp Aurora (shrimp sauteed in a vodka tomato puree and served over penne pasta with asiago cheese) or Steak Gnocchi (blackened steak melds with mushrooms, cream, potato dumplings, sweet peppers and scallions). There are five entrees plus three ribeyes. The Shrimp & Scallops (three huge Digby Scallops with three huge Shrimp sauteed in shallots in a Woodford Reserve Cream Sauce) are probably the star of the show, but the Grouper (panko crusted flash fried in white wine, lemon juice and capers) and Pork Tenderloin (char grilled dry rub with ancho chipotle peppers, aioli, diced tomatoes and scallions) are close. The ribeyes are Butchers, Delmonico and Petite cuts. They make a Very Big Deal of their sides : there's a Rice of the Day, Potato of the Day, Vegetable of the Day and six standards. Shakertown is the greatest historical preservation in Kentucky, and includes Trustees Office (left), one of the state's finest restaurants. Rather than the 21st Century cuisine you might find at Holly Hill, Shakertown features early 1800s food from gardens and pastures right outside your window. They offer breakfasts, lunches, buffets and special garden seatings, but the crown jewel is Sunday Supper, served from noon til 8 pm. For $20 you get an appetizer, main course, bread, dessert and beverage. The menu is limited, but every item is exquisite, beginning with the complementary corn bread fingers and corn pudding. Three stand out : the Country Ham, Buttermilk Fried Chicken, and Potato Dumplings. The dumplings are not the large New England "Donkers" style, but 20 or so jelly bean sized morsels embedded in a hot salad of spinach, baby corn, onions, tomatoes and other season greens. This is, of course, a vegetarian's dream, but it's a great meal for anyone. All the entrees come in portions so ample a take home box is usually needed. First, however, comes dessert. Their Lemon Pie is famous because it includes ALL of the lemon, so you end up tasting tiny bits of rind. But there's sinfully rich Hummingbird Cake. If these people had not worked so hard they'd have weighed 300 pounds each. Shakertown is a spectacular 40 minute drive from Lexington on Route 68. Reservations are required. Go early and walk around. Take your camera. 1-800-734-5611 x360. 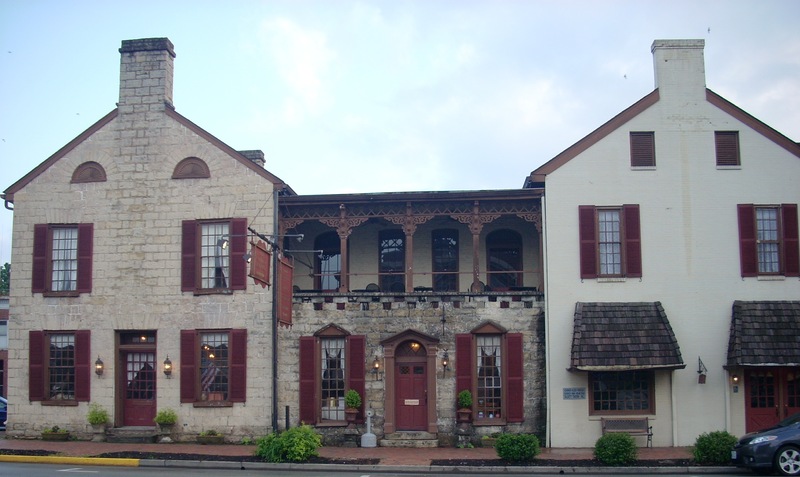 The Old Talbott Tavern in Bardstown is probably the most historic single building in the state. It was the western terminus of the National Turnpike from Philadelphia to Bardstown before Louisville existed. 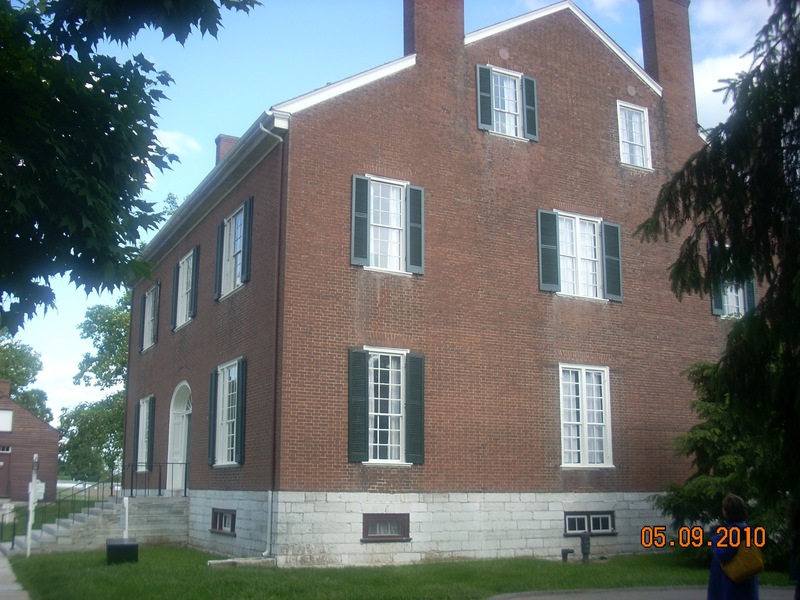 Daniel Boone, Abraham Lincoln, George Rogers Clark, Simon Kenton, Henry Clay, and other important figures of the 1700s and 1800s ate and stayed here, and, in the 20th Century, prominent national heroes like George Patton followed. This is the original tavern, well preserved, not a restoration or remodelling. It's a bit creaky but very photogenic, from the fireplaces to the staircases to the old bar. You could drive down just for lunch or dinner, or spend a night. The food is definitely worth the drive. All the classics are here : Fried Green Tomatoes, Burgoo, Cat Fish, Pot Roast, Country Ham, Cast Iron Skillet Fried Chicken and Hot Brown. There are Kentucky wines and Bourbon from local distilleries. You can walk to Federal Hill, where Stephen Foster wrote state anthem My Old Kentucky Home while visiting. 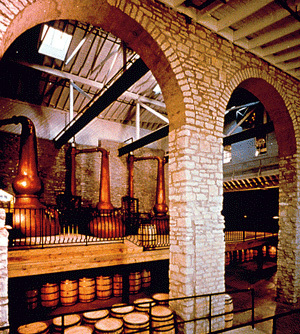 Most people think of Woodford Reserve as the best bourbon distillery in Kentucky. They come for the excellent guided tour, to see what bourbon conneisseurs consider the finest small batch processing plant in the world. It is a beautiful facility, the bourbon they make is exquisite, and the hour long tour is the best of any alcoholic beverage processor anywhere. However, the best kept secret in Kentucky is that the restaurant on the grounds is also outstanding. It's only open for lunch, the menu is only one page, and there's a flat $25 charge. But it's a memorable dining experience. There are three salads : Romaine (spring mix, grape tomatoes, red onions, sunflower seeds, feta cheese and bourbon smoked paprika), Sunshine (shredded carrots and raisins in lemon honey vinaigrette), and Sorghum Slaw (shredded red and white cabbage, scallions, herbs and sweet peppers in Woodford Reserve bourbon sorghum vinaigrette). The Buffet includes Rosemary Roast Turkey (with homemade turkey gravy and Woodford Reserve cranberry orange relish), Spiced Ham (glazed with bourbon and orange with Woodford Reserve blackberry cumberland sauce), Scalloped Potatoes (in cream and permesan sauce), Sage Sausage Dressing (made with onion, celery, sausage, parsley and sage), Corn Pudding (white shoe peg corn baked in custard), Green Beans Almadine (steamed with lemon, olive oil, and almonds), and Acorn Squash (slow roasted with bourbon, brown sugar, butter and cinnamon). Desserts include Chocolate Bread Pudding, Chocolate Bourbon Ball Cakes, and Cranberry Apple Crisp. The menu is obviously designed to demonstrate various ways Woodford Reserve Bourbon can be used in the kitchen, but it also shows off the outstanding culinary talents of Ouita Michel, who with husband Chris also runs Holly Hill Inn and Windy Corners.